This needle features a special taper to the slightly rounded point. Made especially for piecing and machine quilting. The special tapered design allows easier fabric penetration and helps eliminate skipped stitches. 100 needles per box. Designed especially for quilting. These needles have a thin, tapered deep point, which is good for sewing multiple layers. Schmetz Color Code Chart. SCHMETZ needles are easy to identify! 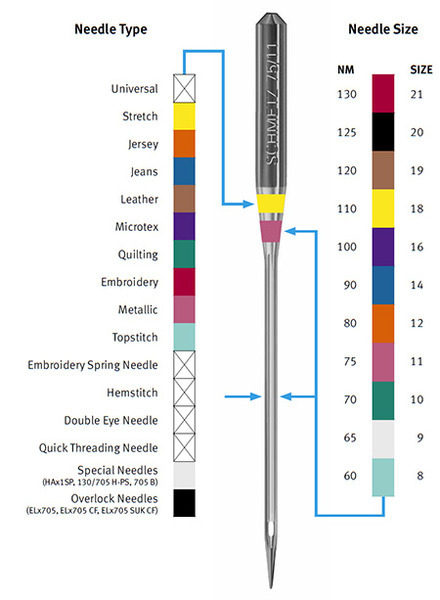 Most needles have two bands of color - the top band to identify needle type and the lower band to identify size. The Universal needle has just one band of color for size. Yahoo! Also available in retail stores in pack of 5, size 11 and 14. I was looking for a site where you could buy needles in bulk & I found it! Thank you!!! I am happy with my order. i will be ordering from your company again in the near future. Thanks. Always a pleasure doing business with your company.